Are you new to unit studies and wondering how you can actually get all your subjects in with just one topic? Take a look at how we do that with our Mother Goose Time Space Unit Study: Blast Off to Space! Arts and crafts is a big one with Mother Goose Time, there are so many great projects and activities that the kids hardly know they are learning! Often I use the time that they work on their craft to teach them something related to our lesson or theme. For example, while they made these adorable UFO’s we learned about Mars, why it looks red, that it has two moons, etc. We talked about aliens, if they are real or not and what that word means. I found this great resource while studying the planets, full of pictures to look at and great little interesting facts about them as well! Check it out at planetsforkids.org. All you need for this craft is some glitter or sequins or gems, paper plates, a small paper cup/pill cup for the middle and some paint. We used grey but you could use any color. Science is impossible not to incorporate when you are doing a unit study on space! This week we learned about Mercury, Mars, and Earth. We have talked about moons and craters and how many miles they are from the sun. We have learned about the planet’s placement, what they are made of, learned about atmospheres. Outer space is a fascinating subject for all of us so we have really enjoyed it. With any child, busy hands often mean a more relaxed mind primed for learning. Have your kids do a craft or cutting project or coloring sheet while you teach. Something is getting done at the same time and they seem to remember it so much easier! 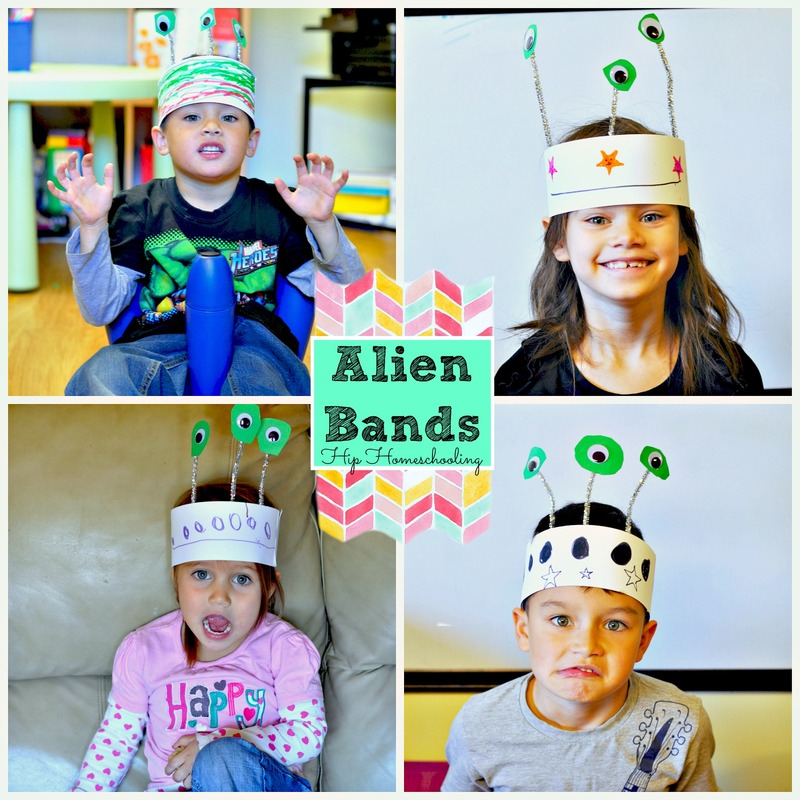 Here is another great craft we made while I stuffed the kids’ brains with tidbits of scientifical information 😉 To make your own alien headband you need a piece or two of paper cut and glued or stapled to fit around your kids’ head, a pipe cleaner and some googly eyes. We used a glue gun so it would be ready faster. I am a BIG fan of the glue gun these days. We have been counting planets, counting moons, comparing them and even measuring their distance on our solar system poster. We have placed ourselves in ratio and been our own spinning planets. We have been counting stars and learning about the number 7 and 17 and playing games to add and subtract moons and compare those to our moon graph. The possiblities are really endless, with older children I would compare distance from the sun in miles or compare tempuratures with earth, etc. This is pretty easy to integrate into your lesson. Have the kids spell and trace or write out names of planets or constellations, have them journal about a trip to outer space or write a story or poem, read a book together about space. We have an awesome one from Experiencing Early Learning called Up In Space. My older kids read it to the younger ones over and over, teaching my littles math and counting skills (as well as scientific information about the planets) and giving my older kids some time to read. Mulch-dimensional learning at it’s best! LOVING unit studies! The only one I haven’t figured out yet is socials studies. Not quite sure how to fit this one in to a unit study about space, maybe you can give me some thoughts! We are loving this theme although super excited to get our box for next month already…. Ocean Commotion. Stay tuned! Hi! Looks like so much fun! I was just going to give you the idea that to incorporate Social Studies maybe it would be neat for them to learn about a Canadian astronaut? That is an EXCELLENT idea! We are absolutely going to do that! Thank you so much for the suggestion! What a well thought out post, I’m going to share it with a couple of homeschooling friends. Thanks! Looks like so much fun! Will have to steal a couple of these for my kiddos! steal away, they are a ton of fun to make! This is a great explanation of how you teach your kids. I know a bunch of topics overlap. These are such cute ideas. I can’t wait to do some of them with my son soon. Thanks Kimberly! They are a hoot.